The Ceramics department welcomes Linda Nguyen Lopez. She earned her MFA from the University of Colorado at Boulder and has exhibited her work in New Zealand, Italy, England and across the US. 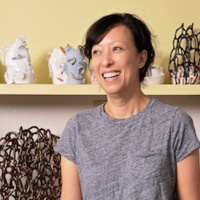 She has been an artist-in-residence at the Clay Studio, Archie Bray Foundation and Greenwich House Pottery and earned the Lighton International Artist Exchange Program Grant in 2016, allowing her to be an artist-in-residence at C.R.E.T.A. Rome. Lopez is represented by Mindy Solomon Gallery in Miami, FL.